The “ID” filter is “range” type. So we have 2 fields : “from” and “to”. 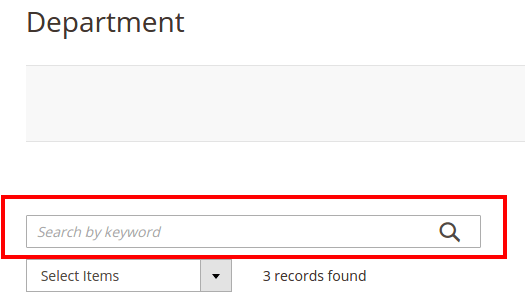 If you want to filter on only one ID, you must put the same value on the 2 fields. The “name” filter is a classic text field. The search inside is a “LIKE %%” on SQL. We will add a new type of filter on Magento 2. If you type a keyword like “marketing”, the filter does not work. We have to declare some columns on database with “fulltext” index. We will update our module to a new version, and adding these indexes on our UpgradeSchema class. At the same time, we will create its for the “jobs” table. For departments, we use only the “name” column. For jobs, we use many columns : ‘title’, ‘type’, ‘location’, ‘description’. We have finished with filters ! Next time we will add massactions and paging ! how can I get the filters (a object) that I’ve applied to a grid in the backend. Code from this page causes duplicated fields in filters area. Fulltext search is working for one column in a grid. I was tried for 2 column its not working, is there any limitation like one table can have one column as fulltext. Also I observed in customer listing page, customer name and email is searchable, but that is not fulltext. I have add custom date-filter in filter section. But after selection of date filter grid data not updated.Please let me know we need to required to change other place.